Priest places a statue of Jesus in a niche. 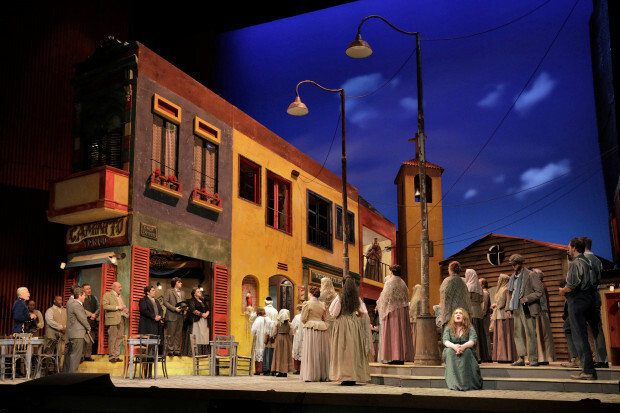 Mascagni's Cavalleria Rusticana and Leoncavallo's I Pagliacci are now in rotation at the San Francisco Opera. I have listed the casts of the two operas together because the two operas have here become one. The story of this production is reasonably interesting. 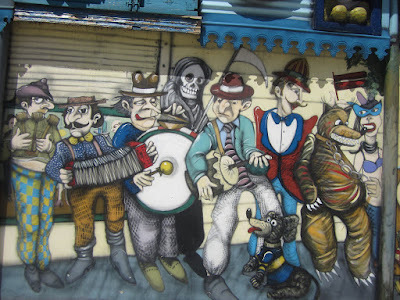 In Buenos Aires, Argentina, exists a mural by Omar Gasparini called Escenografico. Here is a photo of the original. From my seat in the balcony circle I saw the stage in a manner very much like the photo at the top, The mural was shown on the wall at stage left which I saw only fleetingly when the conductor entered. I know about it only from pictures in the program. The famous Intermezzo was staged as a ballet. The church is at the back, and near it is a store that sells vegetables. Mamma Lucia owns the cafe at the front, and when Turiddu sings "O Lola," Lola peeks out one of the windows above and Santuzza peeks out from another. Silvio from Pagliacci is one of Mamma Lucia's waiters. At the end of Cavalleria Turiddo is killed, and his casket is carried by at the beginning of Pagliacci. Mamma Lucia and a very pregnant Santuzza also appear in the cafe in Pagliacci. This unified production made the pairing of these two operas make a lot more sense than is generally the case, but everything was much cheerier than others I have seen. A number of conductors are making their San Francisco Opera debuts this season because we are without a maestro. Callegari brought us a very beautiful, very Italian verismo experience. The singing was excellent if a bit on the heavy side. I even rather liked Berti who was very heavy indeed. The only thing that seemed missing was acting. but (that aside) I wanted to hang out in the cafe.